Born in Marin County, Carrie has always loved the outdoors. She learned to ski at age 6 at Sugar Bowl and enjoyed Saturday ski trips to Squaw Valley on the Mogul Ski Club bus for a mere $12.00 in her youth. Times have changed, but Carrie’s love for the outdoors and the mountains has not. She moved to Soda Springs in 1994 and settled in Serene Lakes a year later. 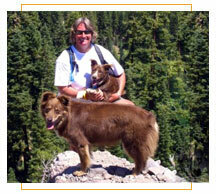 She is very passionate about Donner Summit and loves to introduce anybody who asks to the finer points of the area. After a 20 year career with Federal Express, Carrie began her second career in real estate, specializing in Donner Summit. She has since served as the owner/builder for her own house and is working on two more building projects this summer which means she just about knows anybody one should know. Serving on several community boards and participating in many community meetings and projects, Carrie’s finger is always on the pulse of the local events and breaking news.